My son and daughter-in-law have been on a journey for over 4 1/2 years. An adoption journey. On the 28th of January, 2015 they received the call that they had been matched with a son. On Wednesday of last week they received the long awaited call with their adoption date, the 19th of January. They had originally been told it would be 4-5 months. Their son (they call him Israel) is now 17 months old. They head to Ethiopia on the 13th to meet him for the first time and to make him officially a part of our family. I wish I could post a picture of him, we can’t until the adoption is official. He’s ADORABLE!! My son Jacob was actually the one who inspired me to write a blog. Several years ago he told me he thought I should write a blog and illustrate it. I told him that maybe he should write a blog but that I didn’t know when I’d have time to. So, a few days later, he started a blog–posting nearly every day. Now, the blog has become a book. He wrote a blog for almost 5 years! The book is 120 (I think) of those posts. As we were talking to him about it the other evening, he said that he’d never really planned for when it would come out but then he realized it’d be done by the first of the year. He decided to sell it for $1.99 for the first month. It is available on iBooks. The money will go to augment their expenses for the adoption, which have been huge. If you feel moved to do so, check it out. 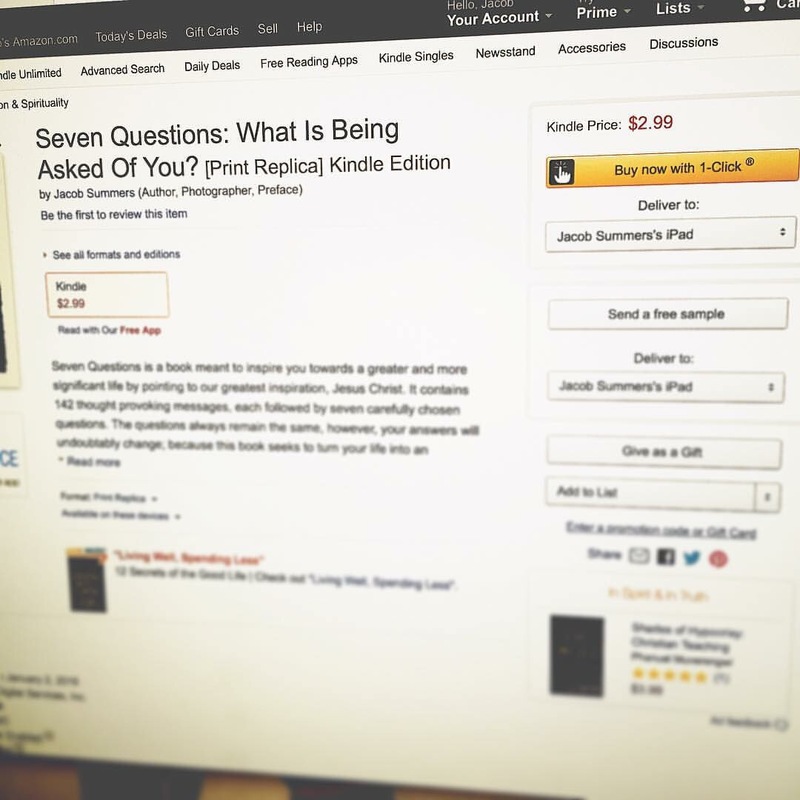 Here’s the link: Seven Questions by Jacob R Summers. nSeven questions (if there are problems with the link please let me know–I can’t seem to get that n off of there). Just in, also available on Amazon for Kindles, etc. A screenshot of the Amazon purchase page that my son posted. It looks like it is a dollar more. As you all know, I was a little slower on the uptake regarding blogging. However, as Jacob experienced, blogging has changed my life and relationship with God. It’d be great if you shared this link to help spread the word and help fund an adoption. Thank you!! God bless. ← Happy Last Day Of The Year! What is his website? Is it public? Hi Dawn, thank you so much! He does have a website but he said he hasn’t updated it well recently. It’s been pretty chaotic here. We just celebrated their daughters second birthday. His website is JacobRSummers.com. I got mine on the Amazon site, I have an android rather than Apple. I am looking forward to reading it and I pray your son and daughter-in-law have everything they need at every juncture in the journey. Thank you so much for supporting him. We are at their home right now. I read him your post, he said thank you for your prayers. Have a wonderful new year and please tell Denton hi.